Last weekend at Otakon in Washington, DC, I had a chance to sit down with the film’s producer, Masao Maruyama. A short, elderly man with short-cropped, graying hair and the wardrobe of an eccentric grandpa (in this case, a Hawaiian shirt, a loose pair of pants, and Crocs), he’s hardly the image of a legendary film producer. But Mr. Maruyama’s credits span virtually the entire modern anime industry. Early in his career, he worked at Osamu Tezuka’s Mushi Productions ( Astro Boy ) and later founded studio Madhouse, where he presided over projects as varied as Death Note , Cardcaptor Sakura , Ninja Scroll , and Redline . In 2011, Maruyama left Madhouse to create a new studio, MAPPA, and then jumped ship again in 2016 when he founded Studio M2. 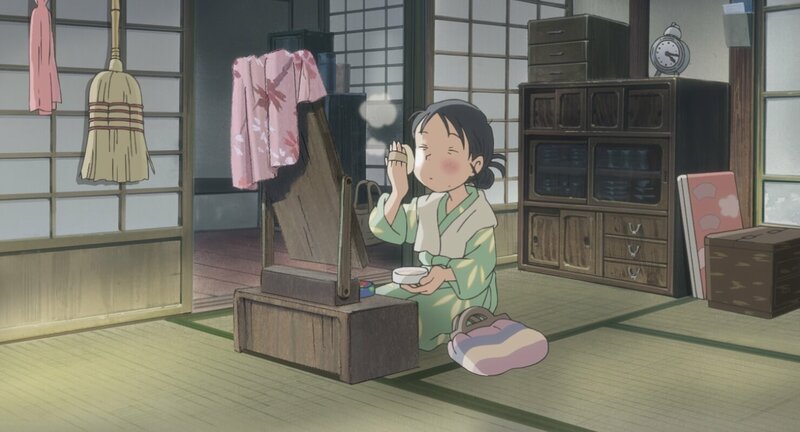 In This Corner of the World is his third project with director Sunao Katabuchi, whose Black Lagoon (2006) and Mai Mai Miracle (2009) were produced at Madhouse. You produced both In This Corner of the World and Barefoot Gen . What were some of the differences in your experiences producing such different depictions of the events in and around Hiroshima? Barefoot Gen was over 20 years ago. It was something that was more appropriate to the times back then: a story about the intense anger of a boy who survived the horrific [atom bomb in Hiroshima] and must continue on to survive in post-war Japan. But it's been 20 years since that. In This Corner of the World is a story where there might be anger, but it's not the same kind of intense anger that Gen has. If there is anger it's much more subdued and subtle in its expression. It's much more about showing a slice of life of an ordinary person. These people will eventually disappear and the next generation won't have an elder generation from whom they can get firsthand testimonials. So one of our intentions was to preserve that in the form of [an animation] and make it available for younger generations to access. So the biggest differences between the two films is the change in the anime audience and production environment that took place between these two decades. It’s much more acceptable to the audience to have slice-of-life stories and subdued stories now. And also the talent of the director, Sunao Katabuchi, really contributed to the ability to make something like In This Corner of the World . You were born in 1941 which means that as a child you lived through the war and Reconstruction. Did you feel a personal connection with what you were putting on screen? I may have been born in 1941 but I was born in a very desolate prefecture, this place called Miyagi Prefecture, so I have no direct war experience myself and no memory of living through war. Life was just ordinary and the war passed through me. I would have been four or five years old when the war ended in a rather unremarkable way for myself. So everything I know about WWII Japan isn’t firsthand experience but something that I learned afterwards. Unlike people who may have firsthand accounts of what it was like pre-World War II or during the war, all of us, including myself and Mr. Katabuchi, learned through our research. And the recreation of what we learned is exactly what we put out in In This Corner of the World . That focus on learning and educating is really interesting. The film does a fantastic job recreating the experience of WWII. Was it a goal of the staff to try to pass on that knowledge of what life was like to people who didn't experience it first-hand? We definitely had that intention. Especially Mr. Katabuchi and I; we’re both are around the generation where we didn’t experience it ourselves, but our fathers and mothers had direct personal experience of what it was like to live in post-war Japan. And so Mr. Katabuchi would hear stories from his father and get the feel for what it was like that way. A lot of the stories and the histories that we uncovered were basically firsthand testimonies that were coming from people the age of our fathers and mothers. These people will eventually disappear and the next generation won't have an elder generation from whom they can get firsthand testimonials. So one of our intentions was to preserve that in the form of [an animation] and make it available for younger generations to access. Changing gears a little bit, on the subject of passing down knowledge: You worked directly with Osamu Tezuka at the legendary Mushi Productions in the 1960s. Do you have any interesting stories from your time at Mushi? In fact, the very reason that we have the style of Japanese animation, anime, I think does go back to Tezuka and especially Tezuka's Mushi Pro-style animation. This would be in contrast with the style of Toei Animation features that's inherited today in the form of Hayao Miyazaki features. They're very beautifully and meticulously made. But what Tezuka pioneered was basically the opposite of that — something that's very rough and quickly made. This was being done in the time before animation was called "anime," in the time when it was derisively more called "cartoon movies" or "manga eiga." But this was a time when Toei was putting out a feature once every two or three years, and this was the limit of the productive capacity of the Japanese animation industry. But then Tezuka came in and boldly attempted to make one animated episode each week. This would have been very rough and a crazy idea, but it was the genius and the insanity of Osamu Tezuka that made it possible. If he had normal sensibilities he would have stopped himself, but he did it because he just wanted to do it. I think it's this sense of bold challenge that we must not lose in the anime industry. It doesn't have to be meticulously made, it doesn't have to be made to perfection, but it's this kind of pioneer spirit and the spirit of challenge that I think we must inherit and preserve as the spirit of Tezuka. Interested in more coverage of Otakon 2017? Check out our podcast, in which we discuss the In This Corner of the World screening, and stay tuned for more!